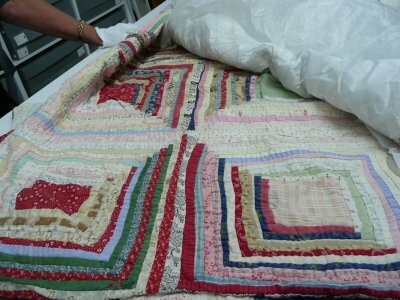 When researching quilt history I came across 'Sergeant Fords Quilt', a case study by Beth McCrystal while visiting our local historical village, the Howick Historical Village in Auckland, New Zealand. 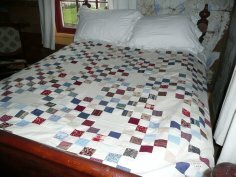 I was primarily looking for photos of bedquilts made in the 1800's and came across this amazing case study. She researched the skills of creating a replica quilt for Sergeant Ford's home at the village. Following is the case study which has been published with the permission of Beth McCrystal. One method of preserving our past is to produce a replica item from a particular time period. In this case it was a replica quilt / coverlet for Sgt. Michael Ford's cottage which was originally built in 1849. I was to provide a replica Sergeant Fords quilt that would add colour to the Ford cottage while still be in keeping with the fencible lifestyle and the era of the village. Sgt. Michael Ford was married to Harriet and at the time of living in this single-unit cottage had six children. The Ford's arrived in Auckland on the 23rd January 1848. While they waited for their cottage to be built, Michael and his family lived in a raupo hut beside the Panmure Basin. The cottage was originally built for the Ford's in Panmure during 1849; it was then relocated to its present site in the Howick Historic Village in 1994. The process of producing a Sergeant Fords quilt replica for the Ford cottage proved to be time consuming and at times frustrating. 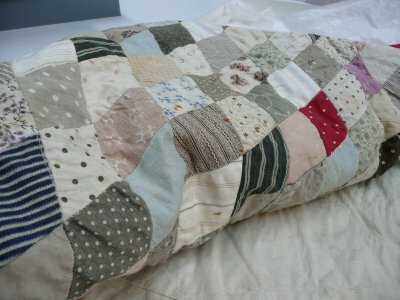 As there was not a quilt on display in the Ford cottage it was decided to produce a patchwork quilt that fitted into the 1850's era rather than an exact copy of an 1850's quilt. Firstly there was a need to establish the types of fabrics, colours and patterning commonly used on quilts in the mid 1800's. 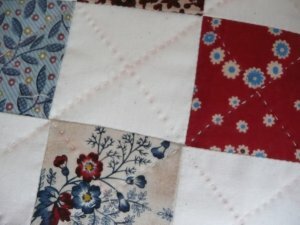 Research included looking at the quilts currently stored in the textile area at the Howick Historical Village, visiting the Museum, Ewelme Cottage, Highwic House, talking to quilters in the local area, internet research and reading up on the history of patchwork and quilting. During the ship journey to New Zealand many women, aware that they would be months at sea (at times up to six), had the forethought to provide themselves with well-stocked needlework baskets to help occupy their time, as well as to make something of use and/or beauty to add to their wardrobe or household soft goods. 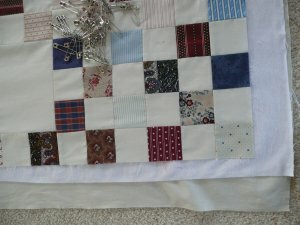 Many a woman saddened by leaving her family and friends, probably never to see them again, must have gained some solace from sewing her patchwork, and when she used pieces of fabric given to her by those women dear to her whom she had left behind, her quilt probably became a real memory quilt. She would only need to look at certain pieces to conjure up the happy or momentous occasions upon which a special friend or sister wore the dress from which the scraps had come. 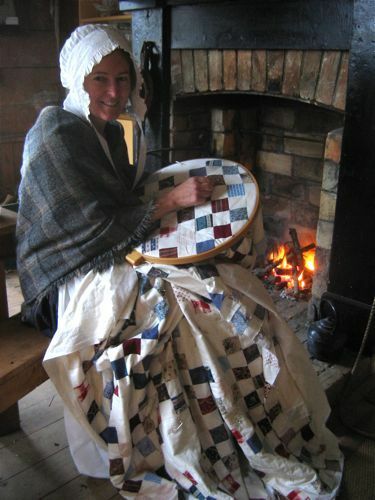 The toil involved in setting up a home and eking out an existence in the new colony did not appear to have provided women with enough leisure time for pastimes such as making quilts, other than simple utilitarian ones to add to or replace worn out bedcovers. The women tended to stay with designs that were familiar to them rather than spend what leisure hours they may have had in developing new patterns. 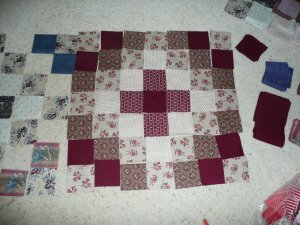 Common patchwork patterns used during this time include nine-patch, hexagon, tumbling blocks and medallion, as well as differing combination's of squares and triangles. 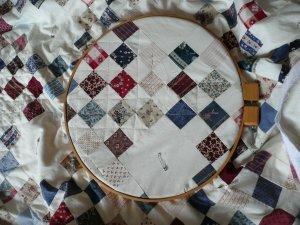 Medallion quilts consist of a central medallion surrounded by a number of borders of varying widths and patterns in variations of squares, triangles and rectangles. Most of the early settler patch-workers stayed with their tried and trusted hexagons, diamonds, squares, octagons and what we now refer to as Log Cabin. Patchwork is needlework in which fragments of cloth are used - either as pieces in a mosaic which are joined edge to edge by stitching or else applied as a decoration to the surface of a background material. 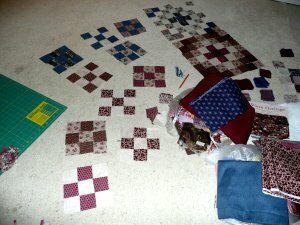 Economy has always provided the stimulus for patchwork. Early settlers were limited in the resources available to them and made sure they used every last scrap of fabric or worn out clothing to the best advantage. Flour bags were also utilized, washed, cut up and used either as part of the patchwork or stitched together to form the backing for a coverlet or quilt. 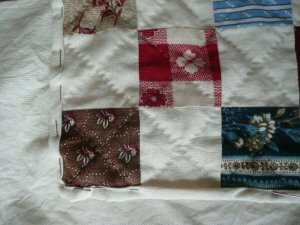 Lining gives support to the fabric, as well as protecting the back of the patchwork. 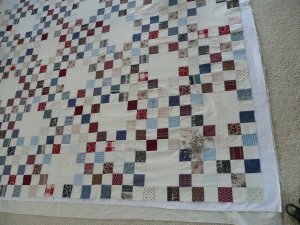 Quilt linings can be made from large square and rectangle shapes of cotton print or calico, old garments which have been unpicked and stitched together to form a flat sheet or flour or sugar bags. Interlining transforms a decorative coverlet into one which becomes valuable for its warmth also. The cheapest sort of padding is cast-off woollen clothing, in which seams have been unpicked and pressed flat. Partly-worn blankets have also been used as interlining; these can be joined carefully to avoid thick seams. Choose suitable pattern - based on basic shapes, in keeping with the era. Patterns were drawn and graphed, discarded, played around with, samples made and discarded, books poured over, photocopied, ideas shown to others to gain feedback (not always positive) before a final pattern was decided upon for the Sergeant Fords quilt. The Sergeant Fords quilt fabric choice was based on common colours of the day, colours to brighten the look of the bedroom. Fabrics were sourced from patchwork shops and from 'stashes' of keen sewers and quilters. The cream colour chosen represents the possible use of clean flour bags as an extra fabric for contrast and/or backing fabric. Flour bags were a ready source of fabric that could be used for a range of useful items such as aprons, underwear and patchwork. Cutting - cutting the squares was a time consuming process. In patchwork accuracy is extremely important. In order for the pieces to match and line up one needs to be very careful in the initial cutting. Pieces of the Sergeant Fords quilt are ready for sewing, then the pieces stitched together, pressed, joined into rows, and then pressed again. Blocks were trimmed and joined into rows of seven. Layers hand quilted together, wooden quilting frame, cream 100% cotton quilters thread Cross hatch pattern on squares, feathered circle within cream centres. 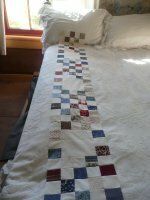 Traditionally quilts are edged either with self fabric folded from the back of the quilt to the front or with another contrasting fabric stitched to the edge and then folded under. In this case self fabric has been folded from the back and slip-stitched to the front. This has been an ongoing project throughout 2008 as part of my Fellowship at the Howick Historical Village. Sergeant Fords quilt has been donated to the Village and will be used for display purposes.